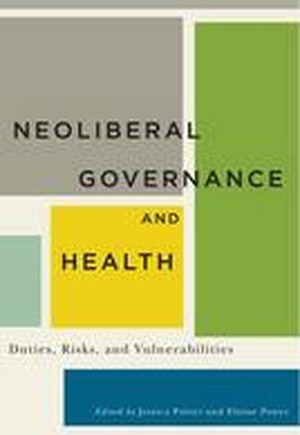 Provoking urgent questions about the politics of health in the twenty-first century, this collection interrogates how neoliberal approaches to governance frame health and risk in ways that promote individual responsibility and the implications of such framings for the well-being of the collective. The essays examine a range of important issues, including childhood obesity, genetic testing, HPV vaccination, Aboriginal health, pandemic preparedness, environmental health, disability policy, aging, contingent work, and women's access to social services. With specific attention to the Canadian context, contributors reveal how neoliberal practices and policies shape the health experiences of individuals, disadvantaged groups, and communities by cultivating self-discipline while further exposing to harm the lives and bodies of those already marginalized in consumer society. Building on the theoretical conceptualizations of power and government of French philosopher Michel Foucault, the case studies extend our understanding of the effects of neoliberal practices and policies in relation to social class, gender, racialized identity, colonization, and ability, and provide insight into how health-related discourse creates new requirements for citizenship and forms of social stratification. A timely intervention in the field of health studies, Neoliberal Governance and Health establishes the need for critical interdisciplinary scholarship to counter the individualizing and marginalizing tendencies of health-related policy, practice and research.